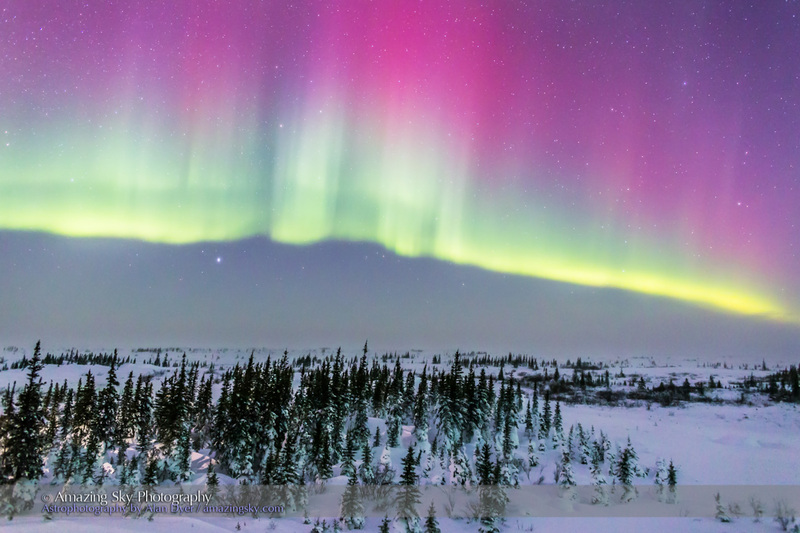 Last night the sky exploded with waves of green and pink as the Northern Lights danced in the bitter cold. 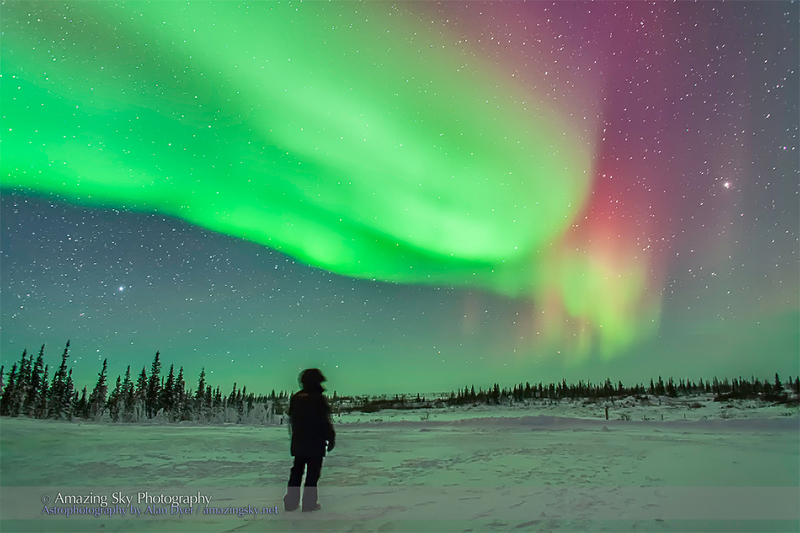 With blizzard conditions forecast for the next two days, last night might have been our last for viewing the aurora from Churchill. But if so, we ended on a high note. The aurora appeared on schedule again at about 9 to 9:30 p.m., following my evening lecture, as it has done every clear night for the last couple of weeks. It began as a sweeping arc to the north, as above, then moved south to encompass the entire sky. 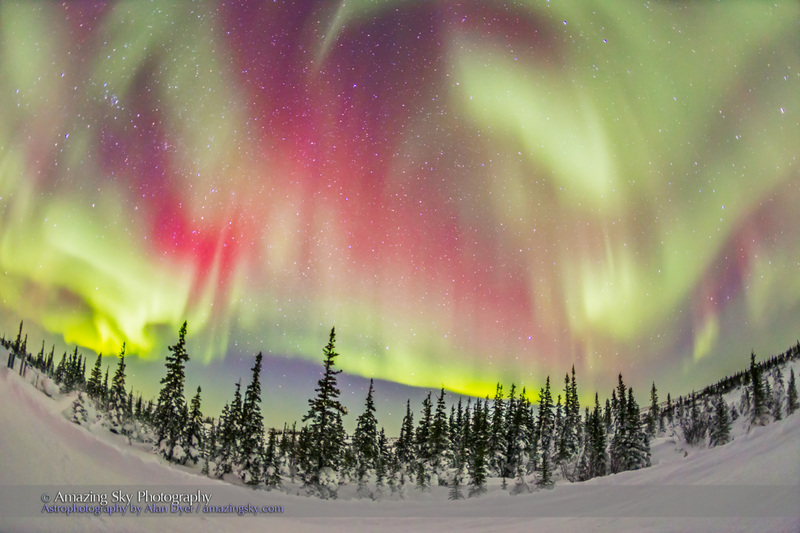 About 11 p.m. the sky burst open with waves of green arcs, but with generous tints of red and magenta that the camera picks up easily. 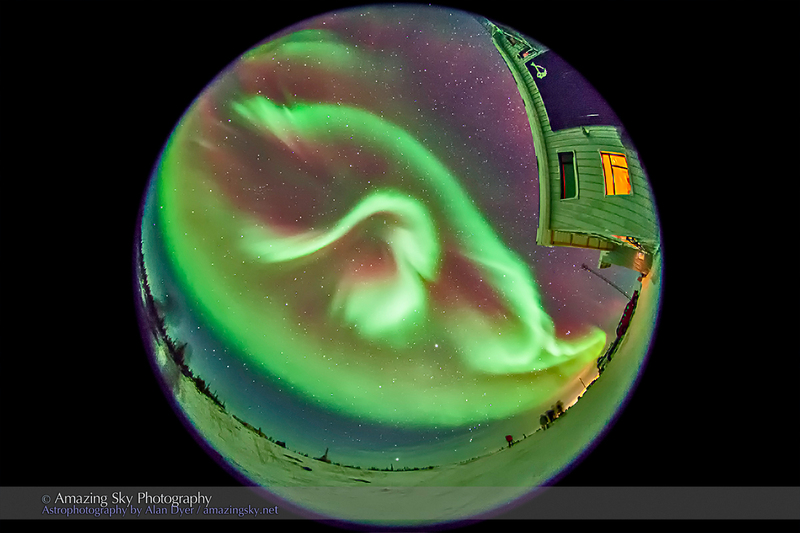 To the eye, the reds are barely visible unless the aurora gets very bright. 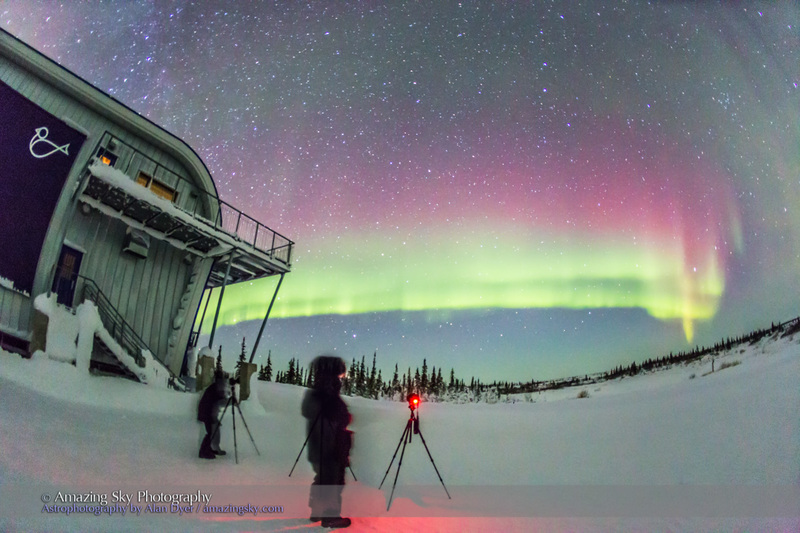 Despite the bitterly cold temperatures of -34° C with a -50° wind chill, everyone in the tour group braved the night to take in the sight. And many managed to work their cameras and tripods, no small feat under such conditions, to get great shots. The groups this week and last saw aurora every clear night, with clear nights on at least 3 out of the 5 nights of each course. 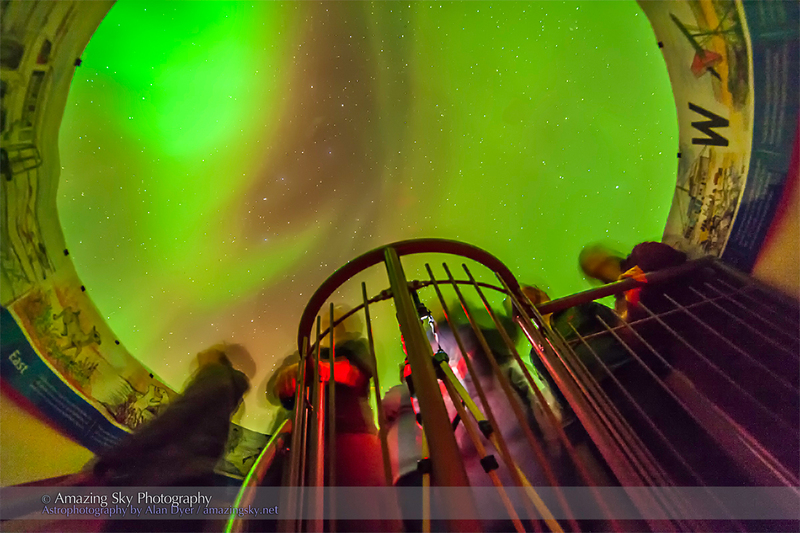 Not a bad take, fulfilling everyone’s “bucket list” dream of standing under the aurora borealis. It was a bitterly cold night for watching the dancing Northern Lights. When Environment Canada issues Extreme Cold warnings for Churchill, you know its cold! With temperatures at -32° C and with high winds last night, the wind chill equivalent was -50° C.
But that didn’t stop us from watching the Lights! I nicely finished my evening lecture at 9 pm when the Lights appeared on cue. They were faint at first, but then brightened nicely by 10 pm. The show was over by midnight, a well-timed and convenient display. 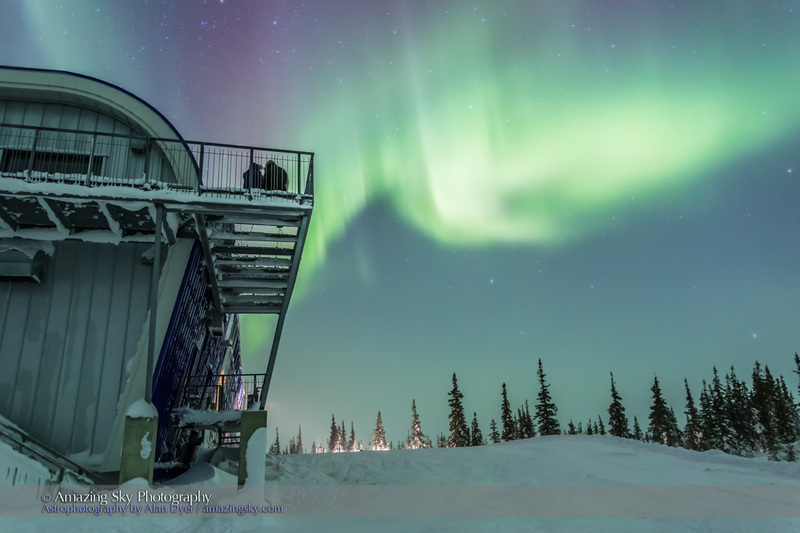 The 22 participants in this week’s course all bundled up and headed out, onto the second floor viewing deck and out onto the ground for views and photos of the aurora. This was not a brilliant display – the official activity level was still reading only 1 or 2 on scale of 0 to 9. But it provided us with some beautiful curtains and lovely colours. The hazy appearance is from high clouds and local blowing snow. The views from the Deck overlooking the boreal forest make for some nice photo opportunities, from a spot largely out of the constant westerly winds. We have three more nights here, though snow is forecast for the last two. 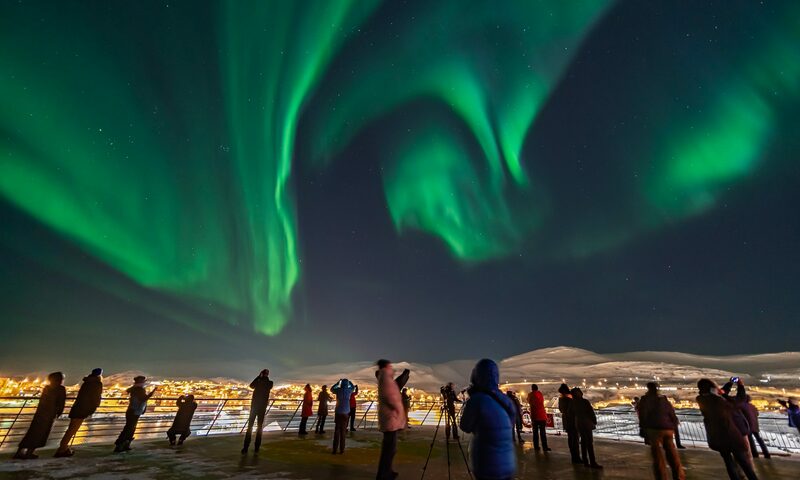 Tonight may be our last night to enjoy the Northern Lights. But all are happy with what they have seen and shot so far. 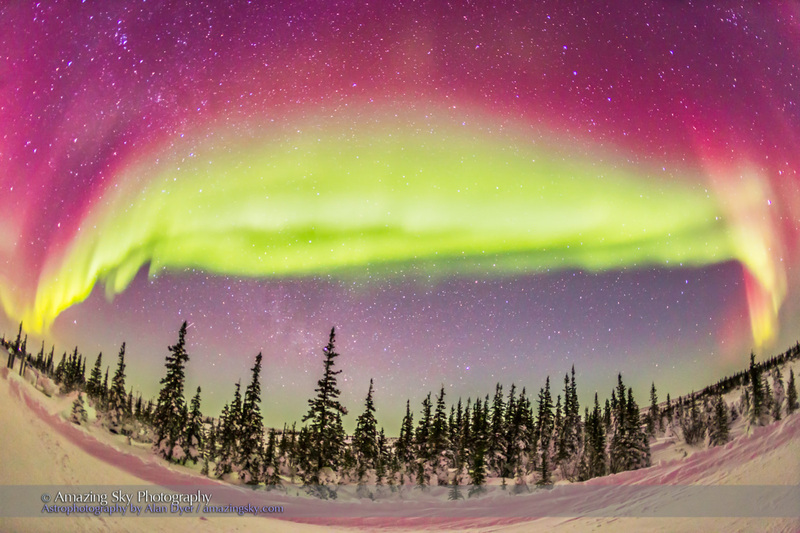 The sky simply does not get any more amazing than this, as the Northern Lights dance across the heavens. 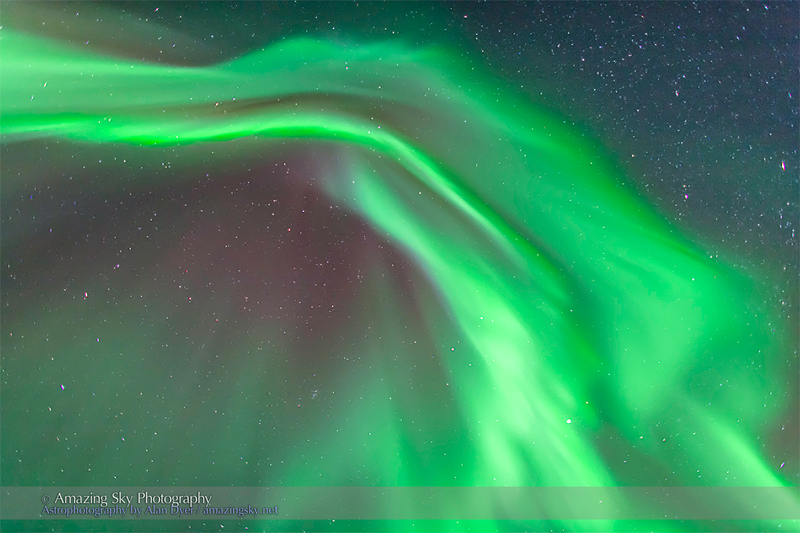 On the last night for our first aurora tour group of the season, the sky performed perfectly. 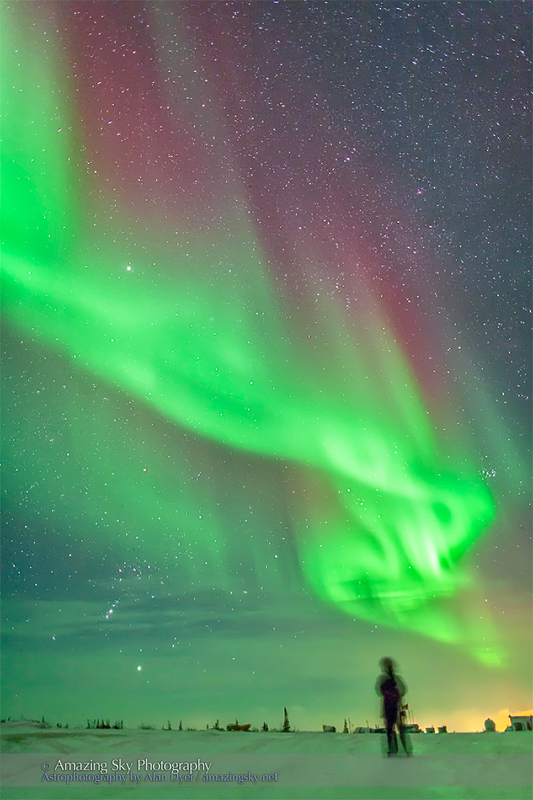 Clouds cleared to reveal a star-filled winter sky, and after the evening talks and farewell drinks, the aurora began to appear. First it was a bright arc across the north, prompting me to try some self-portraits, as below. But at about 2 a.m. a diffuse arc across the zenith exploded into activity, with rapidly waving and weaving curtains. Everyone was awestruck. Some cheered and hollered. Others just watched in stunned silence. Some were busy with cameras. Others just enjoyed the view of a lifetime. 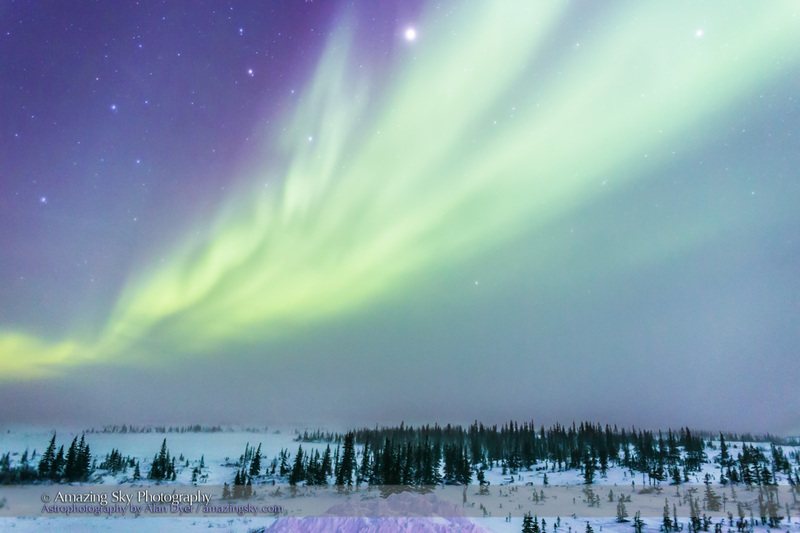 It was a cold night, but the aurora kept performing in waves, dimming for a time – allowing us to retreat to the warm cafeteria for hot chocolate. Then the display would brighten again to the west and a new wave of intensity would sweep across the sky to the east. You didn’t know quite where to look to take it all in. The sight was overwhelming. Here the curtains ripple through Orion, Taurus and Auriga, all setting into the west. 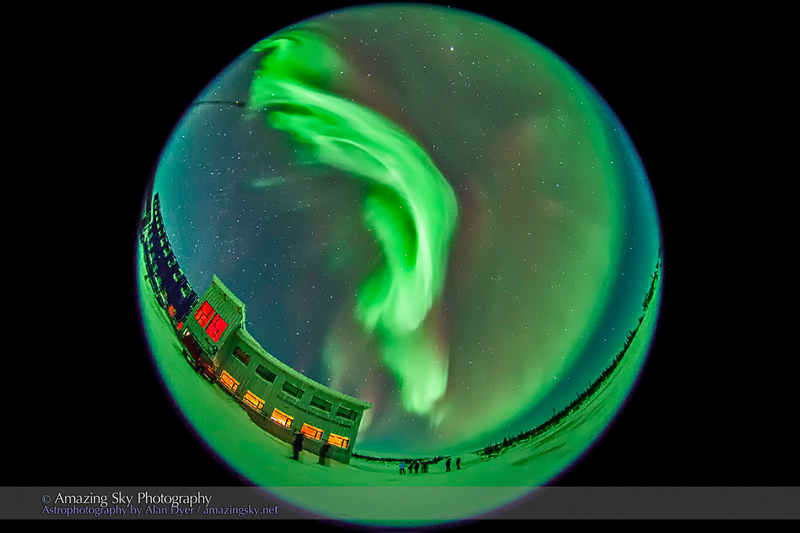 The Churchill Northern Studies Centre has a new building opened in 2011 that is ideally set up for aurora watching. The building can go dark, and is located far enough from Churchill that local light pollution is not an issue. 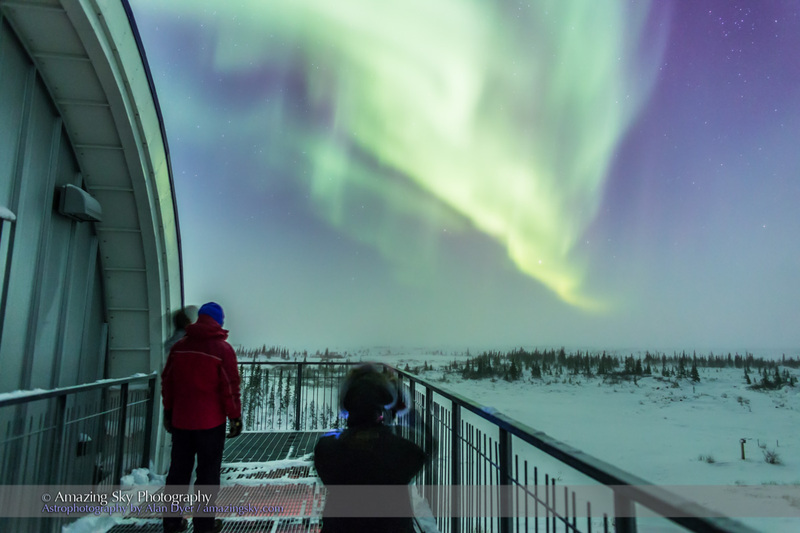 On the roof is a plexiglas dome where several people can view the Northern Lights and the entire sky in shirtsleeve comfort. The image is good enough for wide-angle photography. Sheer luxury! 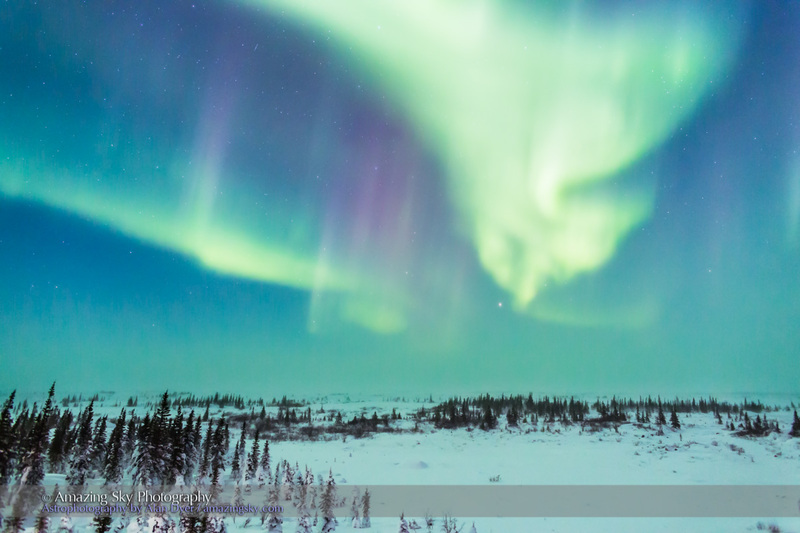 But there’s nothing like being outside on a cold Arctic night, looking up and seeing this sight – thin curtains of light twisting and turning more quickly than you can take in and comprehend. 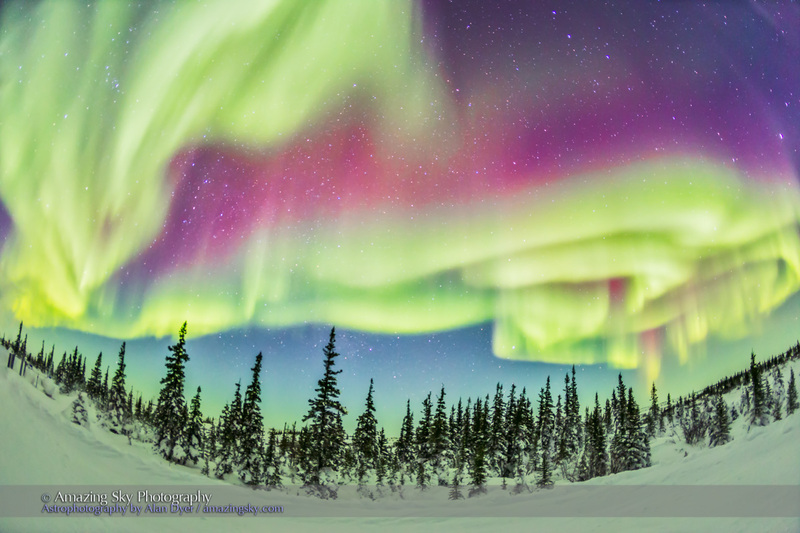 It is one of nature’s greatest shows. And what a fantastic place to see it.